from her weblog "Schrijven met licht"
Gregorius Halman (1948) lives in the countryside near the small community of Blesdijke, southern Friesland, Netherlands. 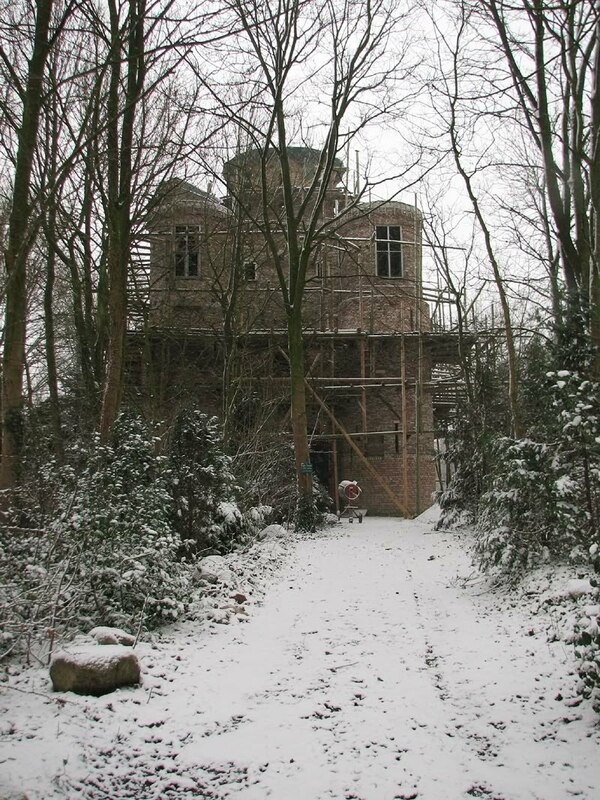 As an annex to his house, he is building a castle ¹. He got the idea to do this around 1990, and it took him two years to convince the local authorities that he formally should be permitted to realise his idea. But he had that dream......making some nice creative construct in roman style, with round and fluent forms, quite different from nowadays functionalist shoeboxes. Often, at lunch time, he went to the public library to study books about roman architecture. He got the permission to build the castle, on condition that the towers would not be higher than 27 meters. In 1992, when he was in his mid-forties, he began his lifetime project. The concept of the building is in principle: a square with on the four corners circular towers. There is an underground basement, with cellars, and nowadays (2010) above ground the construction is advanced to the second floor. In interviews Halman explains that his activity has nothing to do with an obsession, he just has a lot of pleasure in creating some building with beautiful forms in a roman style. As his material he uses old bricks from demolished houses and roads. He does not care about architectural, historical or military compatibilty of the castle. It's not a copy of an existing one, but a product of imagination. * Youtube had a 3.25' video (2007) made by Martin Vlaanderen, which is not available on the internet anymore. In this video Halman explained the ideas behind what he is doing. In Outsider Environments Texts a transcript into english of this conversation. ¹ The name of the castle is "Olt Stoutenburght". Olt means old, stout in former days dutch is brave, in nowadays dutch it is naughty, and burght means citadel. In the Middle Ages a -currently almost disappeared- castle named Toutenburg existed in the area around Vollenhove, some 30 kms south-west of Blesdijke. Thank you very much for drawing my attention to all of these fantastic places! Hi Shayna, I am glad you like the blog. These wonderful places deserve to be known better, and that's what I am aiming at. All the best. For god sake!! a castle of his own. that is what call to make the difference. Some people conforms with writing a few lines, making some strokes on canvas, but this goes beyond. I really laughed when i read about "shoebox architecture" i embrace the idea, but let´s the fans of modern architecture not to hear us or they will burn us in a bonfire. Roman architecture, wondering if it refers to that lovely architecture that preceded the Gothic style, with its simple yet wonderful shapes and masterpieces in mason work by anonymus masters, in the time when artists were considered nothing but simple handcrafters. Nice that you had a look to the Netherlands, i am sure it would have lots of extraordinary places like that, specially when far from the regular touristic schedules. Great to have a dream and to be able to turn it into reality. I'd love to build a castle, with plenty of secret passageways and underground caverns and tunnels, lots of wall space for putting up photos or other art... not sure my budget will ever allow me to accomplish that dream, but in meanwhile, will continue making photos, such as they are. Just completed a post in your honor about the church in Wirwignes... and thanks again for providing the inspiration to go visit some of these places !